COHA’s Senior Research Fellow, Terrence Paupp’s book, BEYOND GLOBAL CRISIS, is an important work not only for students, scholars, and academics, but for all those who should be interested in examining global issues from an East-West, as well as from a North-South perspective. Paupp addresses the issues of nuclear abolition, climate change, the role of the International Criminal Court, the need for a thorough reform of the United Nations, and the importance of human rights to peace and development. In assessing these various challenges and the crisis associated with each of them, Paupp’s work stands in the intellectual tradition of F.S.C. Northrup (1893-1992). Northrup was a professor of both law and philosophy who was acquainted with many of the leading figures in philosophy, politics and science, including Bertrand Russell, Ludwign Wittigenstein, Mao Tse Tung, among many others. Northrup engaged in comparative philosophy in order to analyze and solve the problem of world peace controversies by providing a method of philosophical anthropology to solving global problems which neither capitalist nor socialist economists were able to finish because of their failure to combine intuition with postulation. Northrup combined the two—as has the Japanese peace philosopher, Daisaku Ikeda. It is for this reason that Paupp chose Ikeda and the methodology employed by Ikeda to address the global problems and challenges that stand in the way of achieving peace in the 21st century. Ikeda’s methodology employs three distinct but strongly interrelated concepts: (1) inner-transformation; (2) dialogue; (3) world citizenship. By using these categories—all from an Asian perspective—Ikeda postulates that we can develop the capacity to re-conceptualize the problems that beset the world and its dynamics which transpire both within and between people. It is through this methodology that Ikeda postulates, as did Northrup, that we can know whether the world in its universality and necessity, and work with predictability. Paupp takes this methodology and compares it to progressive thinkers East and West, North and South, who seek to address the best ways to build forms of communication and dialogue that can lead to the peaceful resolution of conflicts and disputes, can assist in reforming old national and global institutions while building new ones that are more appropriate to meeting the human rights crisis often featured in the 21st century. In so doing, Paupp may have uncovered in the approach of Ikeda the simple truth that concepts are in the West “by postulation,” while in the East, “by intuition. Paupp asserts that around the world, peoples and nations are becoming more open to a strategy and culture of peace that evolves through discovering a commonality of interests, the value of mutual cooperation, and the desirability of forging consensus. Meanwhile, Paupp argues that by using various road maps and other theoretic remedies supplied by noted Japanese peace activist Daisaku Ikeda and his contemporaries, viable solutions could emerge. In this task, the reader is enjoined to become engaged in remaking the character of global governance in order to build a most valuable global culture of peace. This task is not a new one. It was prefigured in the speeches and lives of Martin Luther King, Robert F. Kennedy, and John F. Kennedy. The elements of such a strategy of peace are outlined by Paupp in a case-study on the Cuban Missile Crisis of 1962. 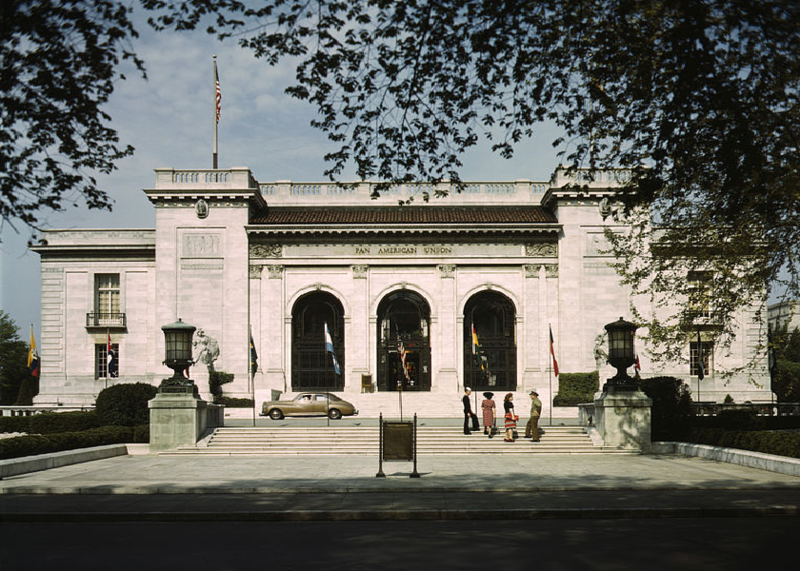 Paupp devotes an entire chapter tothat may have been key, discussing how JFK and RFK worked with Khrushchev to initiate dialogues and negotiations which would not only resolve the missile crisis, but leading part of the signing of a comprehensive nuclear test ban treaty by October 1963. From the perspective of Ikeda, the resolution of the crisis began with an inner-transformation of consciousness by the leaders of superpowers. This inner-transformation created the groundwork for a dialogue in which mutuality of interest could be discovered. From this discovery, it became evident that there could develop a “rapprochement” which entails standing down, a move away from armed rivalry to a relationship characterized by mutual expectations of peaceful coexistence. This very same dynamic can be seen as attainable in the social and economic realms of existence when Martin Luther King struggled not only for civil rights within the United States, but as well called for human rights and social justice in South Africa.. King’s call to bring an end to racial apartheid was a universal call—one that American citizens shared with the citizens of South Africa. As an “apostle of change,” Robert Kennedy, expressed a similar perspective when he declared that: “Around the world—from the Straits of Magellan to the Straits of Malacca, from the Nile Delta to the Amazon Basin, in Jaipur and Johannesberg—the dispossessed people of the world are demanding their place in the sun.” It is a theme which has echoed and resounded throughout all of Latin America as the call for a “theologia de liberacion” (“theology of liberation”) has simultaneously condemned unjust political and economic structures of oppression while, at the same time, calling for social justice and human rights in the midst of poverty, structural violence, and economic oppression and inequality. Ikeda’s call for change in these situations and by these means is located in his understanding of the practice of “human revolution.” It is a revolution which involves the Buddhist practice of cultivating an awareness of one’s life condition and making a diligent, constant effort to elevate that condition through self-mastery, through altruistic living, and humanitarian competition. This kind of “human revolution” is powerful because it provides a pathway so that people can come to understand the linkage which exists between self-transformation and simple societal transformation. Commenting on Ikeda’s perspective, Paupp wisely notes: …if humanity is to ever overcome this ceaseless cycle of violence, affronts to human dignity, and global space to human rights regime, then the starting place must be within individual frameworks of meaning, of closely held concepts, and of our overarching worldview” (p.115). In this regard, both the perspectives of Ikeda and Paupp have a great deal in common with Robert F. Kennedy’s inspirational words to the people of South Africa on the occasion of their graduation: “Each time a man stands up for an ideal, or acts to improve the lot of others, or strikes out against injustice, he sends forth a tiny ripple of hope, and crossing each other from a million different centers of energy and daring those ripples build a current that can sweep down the mightiest walls of oppression and resistance.” Just as Kennedy urged people to stand for an ideal—a postulate for building a more humane world—so too his faith in reliance on such idealism constitutes an intuition that the “mightiest walls of oppression and resistance” can be swept away. 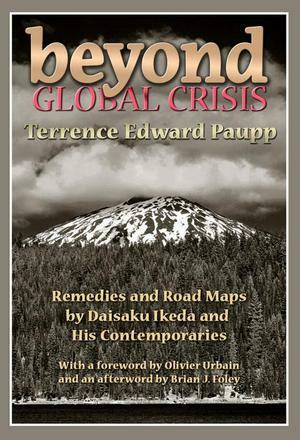 Similarly, the road maps and remedies outlined in Beyond Global Crisis by Ikeda and his contemporaries offer the combination of a similar postulate and intuition for developing pathways, road maps and remedies that will be capable of assisting all of humanity to supersede the global crisis of the 21st century. In Chapter 2, Paupp addresses the question: “How do we move from a culture of violence to a culture of peace?” He suggests that the answer to this question should be predicated upon what we call our “identity”— and how that identity is framed. In making this argument, Paupp relies on the views of Ikeda and his contemporaries. Collectively, they speak of the need for resistance to a global system that encourages reliance on war, violence and conflict, but remains hopelessly lacking in its capacities, policies and programs for advancing our common humanity. It is with this problem in mind that, in Chapters 3, Paupp expands our conception of the international system by looking at the case-study of the 1962 Cuban Missile Crisis and its peaceful resolution. After all, its successful conclusion was in large measure responsible for leading the US and USSR to embark upon detente, the commonly perceived need to construct nuclear weapons free zones (NWFZs), and the search for agreements to advance the cause of nuclear non-proliferation. In the decades which followed, the Delhi Declaration of 1978 outlined an approach to nuclear weapons abolition which has been renamed as a “Nuclear Weapons-Free World” (NWFW). In turn, it is an idea that has intensified global pressures for a Nuclear Weapons Convention (NWC), such a comprehensive convention would effectively prohibit and eliminate all nuclear weapons and their infrastructure. Such a global result would be the fulfillment of the dreams of Alfred Einstein, Bertrand Russell, John Kennedy, Robert Kennedy, Martin King, Daisaku Ikeda, and countless others. These specific ideas are discussed in greater detail within the context of Chapter 7, where Paupp outlines his approach for invoking the principles of what he calls “inclusionary governance”–as a means to effectuate the process of nuclear weapons abolition. In Chapter 4, Paupp embarks upon an analysis of Ikeda’s linkage between the power of self-transformation and external liberation. The argument that is presented emerges out of the nexus where Buddhism, liberation theology, and international human rights law are conflated in a complementary manner to stand for the proposition that seeking genuine change in the external world is predicated upon genuine change in the internal world of a one’s mind, spirit, and body. Again, postulate and intuition are united to form a synthesis between Eastern and Western views on how to build a global culture of peace. In order to illustrate the point, a recounting of the words and actions of Herbert Marcuse, Gustavo Gutierrez, Martin Luther King, Rajni Kothari, Richard Falk, Daisaku Ikeda, and Robert Kennedy are brought to bear on the need to defeat egoism and an all too comfortable reliance on technological advances as a substitute for building a more justice-oriented global order. In further explicating this point, Paupp brilliantly undertakes, in Chapter 5, to provide the reader with a living model for these practices in the form of the Association of Southeast Asian Nations (ASEAN). The principles by which ASEAN is guided are contained within the Treaty of Amity and Cooperation, adopted at its Bali summit in 1976. In keeping with the Asian tradition of seeking consensus, it is evident that the treaty’s central and overarching goal is “to promote perpetual peace, everlasting amity and cooperation.” The treaty stipulates that relations between members should be guided by six basic principles—all of which center upon the renunciation of the threat or use of force, as well as an enduring commitment to maintain effective cooperation among themselves in all matters of mutual concern. These same principles and approach, Paupp maintains, are at the heart and center of erecting a peaceful global civilization. Chapter 6 offers an an analysis of the converging theoretical and empirical elements of such a global civilization, because according to Paupp, a central starting point on the path to a peaceful global civilization involves the need to revisit human rights law and the law of humanity. This analysis invariably leads to discussing and acting on a “human right to peace.” It is clear from Article 28 of the Universal Declaration of Human Rights that: “…everyone is entitled to a social and international order in which the rights and freedoms set forth in this Declaration can be fully realized.” Yet, the attainment of this peaceful global order is blocked by the continuing a presence of a reliance on nuclear weapons, a resistance to reforming the United Nations for the needs of the 21st century, and a failure to fully invoke the purposes and power of the International Criminal Court (ICC). Therefore, in Chapter 7, Paupp discusses the emerging pillars of a peaceful global civilization, which are: (1) nuclear disarmament, (2) United Nations reform and (3) the full emergence and use of the mandate of the International Criminal Court. In this context, Paupp builds on Ikeda and his contemporaries to advance the imperative of nuclear weapons abolition in juxtaposition to the Nuremberg Principles and Nuremberg Charter. In so doing, Paupp proposes his own legal principle for such an approach to peace, which he calls the “Principle of Hegemonic State Accountability” (PHSA). Building on the findings of the 1996-Advisory Opinion of the International Court of Justice (ICJ) and the mandates of the UN Charter with respect to the threat and use of force, Paupp argues that the PHSA fundamentally means that geopolitical strategies cannot be tolerated by the international community when such strategies are used to circumvent peace processes and the UN Security Council—as was the case with the Iraq War of 2003. Chapter 8 undertakes an examination of the challenges presented by climate change. Paupp argues, in accordance with Ikeda, that we need to expand the circle of human solidarity so that the current “climate of mistrust” between the Global North and the Global South can be transformed into a “climate of human solidarity.” In the spirit of Ikeda and his contemporaries, the best way to advance harmony, coexistence, and co-prosperity among nations most likely would be by applying the Buddhist principle of “esho funi”–that sees the self and “the Other” (the self and the environment) as being inseparably and cooperatively interconnected. 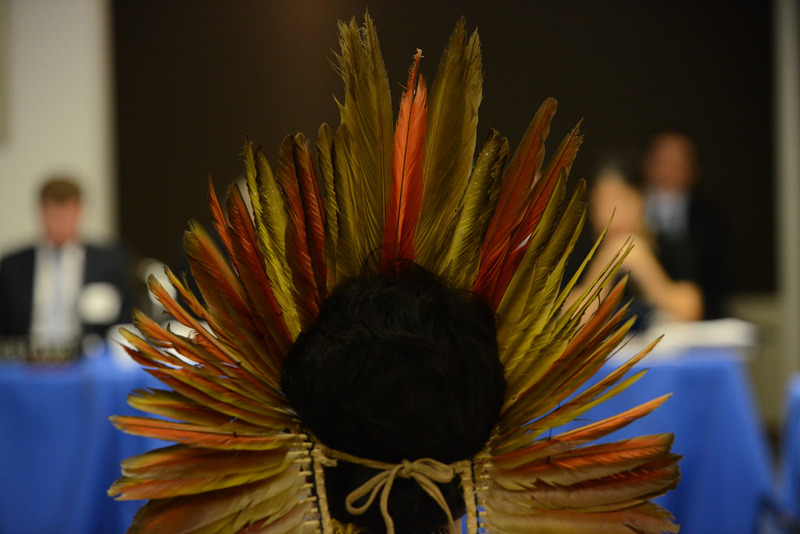 This is especially necessary if the “human right to development” is to be realized for all peoples—especially the world’s indigenous peoples who have been intruded upon by exploitative multinational corporations, ruthless global financiers, and governments that have failed to be held accountable to international human rights standards and UN treaties and covenants with respect to the “human right to development.” This same approach is necessary and essential for realizing the “human right to peace.” Only by recognizing the self and “the Other” as being inseparably and cooperatively interconnected can human beings come to the realization that war and planning for war is antithetical to the human interest and efforts to build a global culture of peace. In his solid conclusion, Paupp argues that the indivisibility of human rights points in the direction of human solidarity rights. While not a popular concept among some international relations scholars in the Global North, it is clear to Ikeda and his contemporaries that the human rights to peace and development are actionable, realizable, and need to be implemented in both the Global North as well as and the Global South. In explicating these themes, Paupp has produced a book that is hugely able to bridge the divides between East and West or the Global North and the Global South. In so doing, he has performed the important task of giving voice to the voiceless.